One day, even though the bond prices are still climbing, a risk manager at the original local bank decides that the time has come to demand payment on the debts incurred by the drinkers at Heidi's bar. He so informs Heidi. Heidi then demands payment from her alcoholic patrons. But being unemployed alcoholics, they cannot pay back their drinking debts. Since Heidi cannot fulfill her loan obligations, she is forced into bankruptcy. The bar closes and her eleven employees lose their jobs. Suppliers of Heidi's bar had granted her generous payment extensions and had invested their firms' pension funds in the various BOND securities. They find they are now faced with not only having to write off her bad debt but also with losing over 90% of the presumed value of the bonds. Her wine supplier claims bankruptcy, closing the doors on a family business that had endured for three generations. Her beer supplier is taken over by a competitor, who immediately closes the local plant and lays off 150 workers. Fortunately though, the bank, the brokerage houses, and their respective executives are saved and bailed out by a multi-billion dollar, no-strings attached cash infusion from their cronies in the Federal Government. The funds required for this bailout are obtained by new taxes levied on employed, middle-class, non-drinkers who have never been in Heidi's bar. So, there you have it. 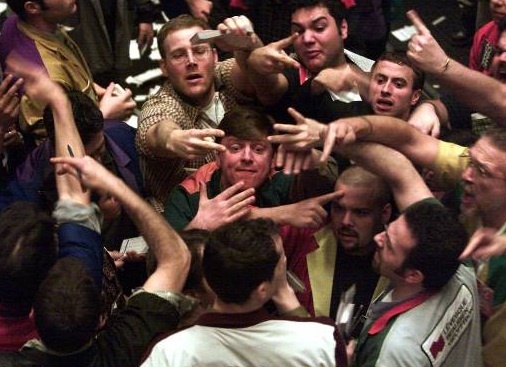 An easy explanation of how to understand the derivative market and why they caused chaos. Thanks to a client, for sending it in.